MUMM-RA transforms into JAGA, appears before LION-O and tells him that the new THUNDERCATS, LYNX-O, PUMYRA and BEN-GALI along with SNARFER, plan to overthrow the ThunderCats and take over Third Earth. MUMM-RA then transforms into TURMAGAR, THE TUSKA, visits LYNX-O, PUMYRA, BEN-GALI, and SNARFER at the Tower of Omens and tells them that Tuska Territory is in grave danger. Along with MUMM-RA/TURMAGAR, they take the ThunderStrike to Tuska Territory. 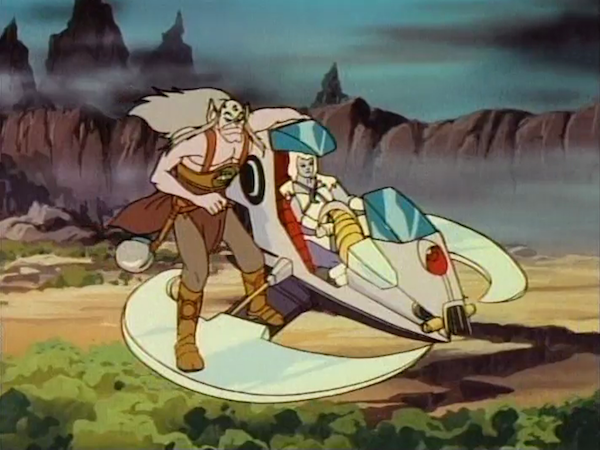 They contact the ThunderCats at Cats’ Lair, inform them of the TUSKA’s situation and plan a rendezvous. Believing this to be a trap, a suspicious LION-O tells the other ThunderCats of MUMM-RA/JAGA’s warning, asserting that JAGA is never wrong. The ThunderCats, however, board the ThunderTank and agree to investigate. 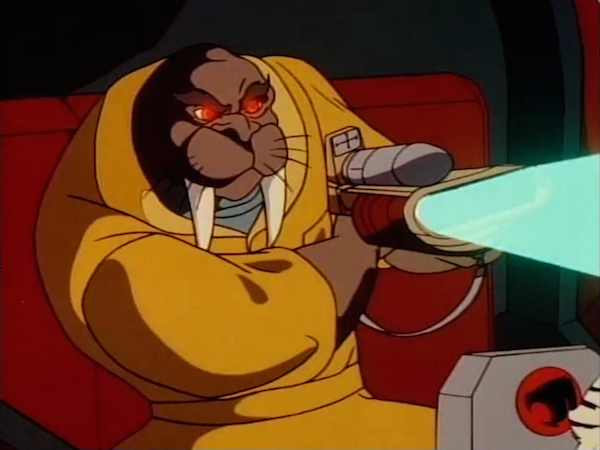 Aboard the ThunderStrike, MUMM-RA/TURMAGAR fires his Tuska Laser Gun at the approaching ThunderTank. The ThunderCats conclude that JAGA was telling the truth and the new ThunderCats are indeed their enemies. Both vehicles collide, throwing all of their passengers to the ground. With the old ThunderCats battling the new ThunderCats, the LUNA-TAKS attack the unguarded Cats’ Lair and Tower of Omens. Alerted to this, LION-O summons all of the ThunderCats using the Sword, but they fail to stop fighting and acknowledge the signal. Finally realizing the truth about MUMM-RA/TURMAGAR and MUMM-RA/JAGA, the ThunderCats end their battle, rush to LION-O’s side and save both of their fortresses from destruction. Witnessing MUMM-RA’s defeat, the LUNA-TAKS abandon him and flee to SKYTOMB. Mumm-Ra sets out to sow discord among the ThunderCats through deceit and trickery. Disguising himself, first as Jaga and then as Turmagar, he creates mistrust and doubt among the ThunderCats about their motives and allegiances. The ThunderCats are taken in by his powers of suggestion and acts of instigation. Failing to confirm in reality what has only been suggested in appearance, they take to fighting among each other. Meanwhile, they weaken their defenses to Cats’ Lair and the Tower of Omens, which are almost taken by the Luna-Taks. When called by Lion-O and the Sword of Omens’ signal, they realize their mistake in time. Reunited, they repel the Luna-Taks, and Mumm-Ra. The ThunderCats learn the lesson to “look before you leap.” When we act impulsively in our lives, without considering all aspects of situations we encounter, we often do not choose the best course of action. Without having the whole story, it is easy to make errors in judgement. For example, we may make false accusations or wrongly place blame on others, because we do not understand their motives for acting as they did. Or, beginning a project without knowing all it entails may lead to failure because we underestimated what resources are needed or how long it will take. On the other hand, when we don’t act impulsively we take the time to consider what we are facing and the best possible course of action. By delaying, we can engage in thinking constructively by defining the problem we face, learning about all its causes and components, and consider a variety of means to resolve it. A house divided against itself cannot stand. Or, at least, that’s what Mumm-Ra hopes will happen in this episode. His scheme to sow misunderstanding and discord between the new ThunderCats and the old is a decent one, but the ThunderCats themselves make everything so much worse by acting without thinking. Chris Trengove, in an attempt to teach us about looking before we leap, forces our heroes to act out of character, when he could have constructed a much more nuanced look at mistrust among new friends. The ThunderCats’ faith in Jaga’s words is understandable, and the second part of Mumm-Ra’s plan—to embed himself as Turmagar and spark the conflict—is clever; but the degree to which things escalate at the rendezvous point is disgraceful. The ThunderCats all seem to forget that they can talk to one another. Bengali, for instance, should immediately hop on the radio and explain to Panthro that Turmagar’s gunfire was an accident. Moreso when the ThunderTank returns fire. There’s no reason for Bengali and Pumyra to escalate the firefight further, and even less reason for the combat to turn hand-to-hand without some opportunity for conversation. 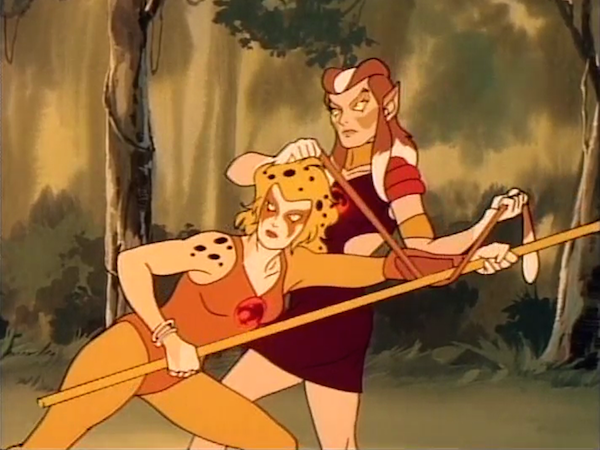 For all its shortcomings, the conflict actually resolves itself in a very sensible way: upon seeing the ThunderCat Signal, both sets of Cats show sincere concern for Lion-O and finally start talking to each other. 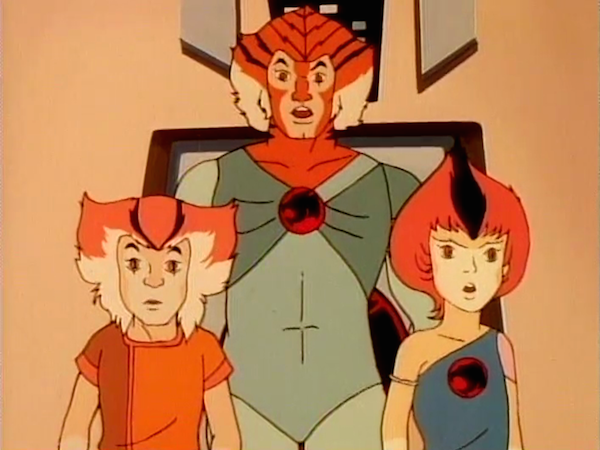 Later, as a sign of the friendship being fully healed, Lion-O works together with Pumyra, Bengali, and Snarfer to rescue Lynx-O and retake the Tower. 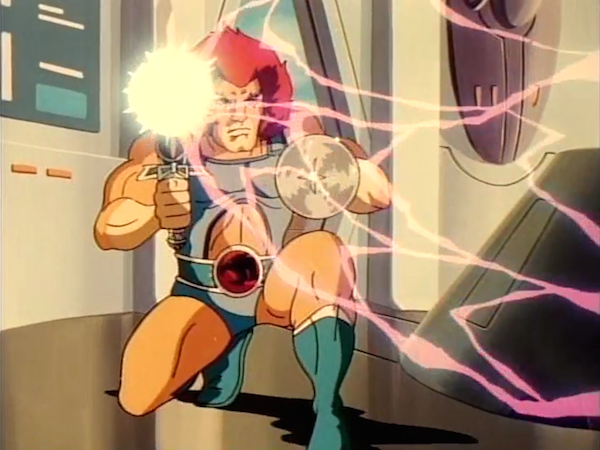 Lion-O even uses Lynx-O’s lightshield to save the day, because the Sword of Omens can’t do it alone! But at no point does anyone recall Mumm-Jaga’s warning or question its legitimacy. Likewise, Mumm-Turmagar’s call for help in Tuskania is forgotten once he vanishes. In the end, all we get is a lesson about saying hello before starting a civil war . Some of the most interesting parts of this episode actually involve the Lunataks, in this, their first standalone episode. Luna, for instance, visits the Black Pyramid, and her conversation with Mumm-Ra has the same fingers-crossed-behind-my-back feeling that Slithe’s early conversations with him do: each inherently deceptive and power-hungry, and neither really trusting the other. 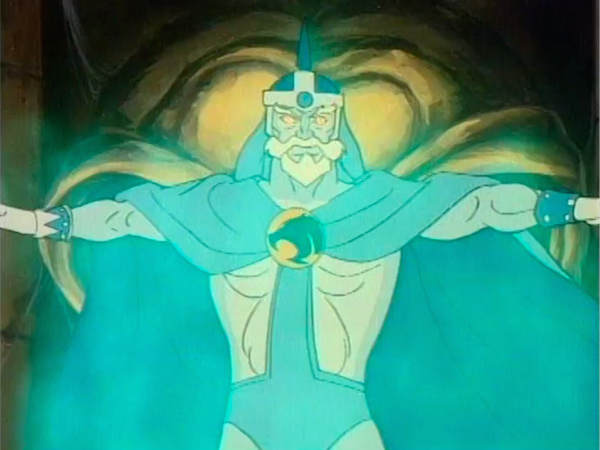 Later, in SkyTomb, everyone is skeptical of Luna when she advocates for Mumm-Ra’s help; but when Mumm-Ra shows up, they’re suddenly highly enthusiastic to go along with his plan. They are either complete cowards, or they just don’t trust Luna’s leadership. Possibly both. Finally, when the battle at the Tower turns south, Chilla and Alluro turn tail. They have no investment in continuing the fight, and are realistic enough to know that they’d lose. Chilla even suggests that the fight is really about Mumm-Ra’s own personal beef with the Cats, of which she wants no part. The Mutants were never so interesting as this! 1 ^ Mumm-Jaga’s exit in a puff of purple smoke is also conspicuous. 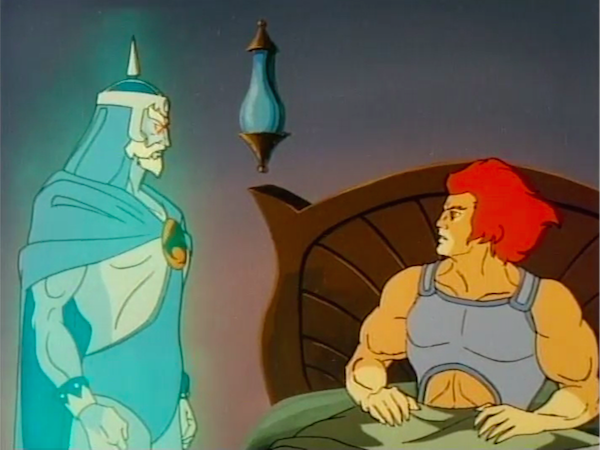 That Mumm-Ra gets this detail wrong is no surprise, but that Lion-O doesn’t notice is pretty egregious. The glowy yellow eyes are a giveaway, too. 2 ^ Tygra’s presence might have made a difference, but he and the Kittens were on a field trip for the whole episode. This the first of many episodes in which—like footnotes in an episode review—there simply isn’t room in the story for all the Cats. 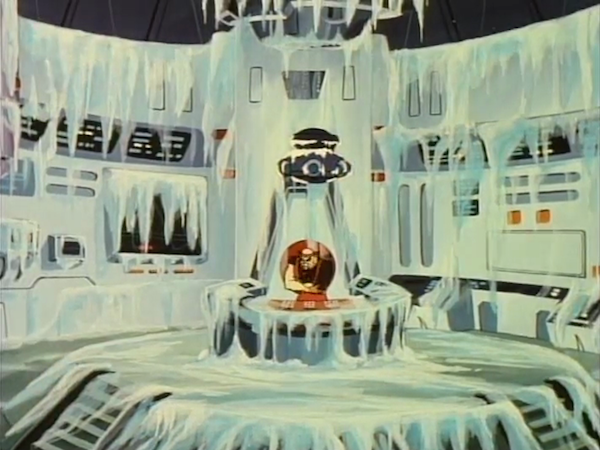 The skylight through which Mumm-Ra exits the Pyramid is heavily ornamented in this episode. Mumm-Ra would take the disguise of Jaga again in the “Return to Thundera!” five-parter. The scene in which Mumm-Jaga appears to Lion-O is scored with Jaga’s theme, rather than spooky or sinister music, perhaps to put us in Lion-O’s mindset. The gravity carbine’s effect is shown to wear off on its own: Lion-O goes from debilitated to normal over two scenes. When fleeing Cats’ Lair in the Lunattacker, Luna consciously abandons Amok. Her lack of concern for him comes into focus most strongly in “Mumm-Rana’s Belt”. This is the first appearance of Chilla’s Ice Runner, which she summons with a nonchalant tap of her insignia. Isn’t it odd that she’s the only Lunatak with a dedicated vehicle? 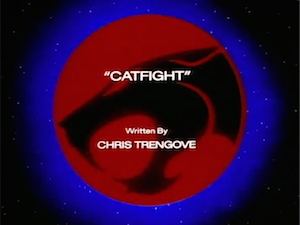 As the ThunderCats laugh at Snarf and Snarfer’s confrontation at the end of the episode, we hear Snarfer bark, “What are you laughing at? !” This may be an ad lib, but it’s an interesting peek at Snarfer’s competitive side.